Carved from China’s Taihang Mountains by 13 villagers, this famous road has become a major tourist attraction for visitors to China. 4,000 hammers and 12 tons of steel were used to create the 3,937 foot long tunnel, with construction being completed in 1977. 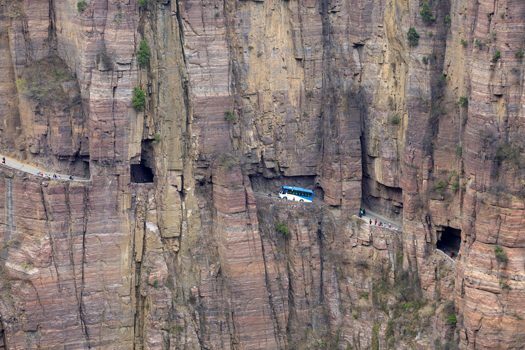 Built to connect the remote village of Guoliang with the rest of civilization, it is one of the 10 steepest roads in the world and includes more than 30 mountain “windows” of different shapes and sizes. Use of the tunnel is shared between vehicles and pedestrians, and with several unexpected dips and turns, it requires serious concentration.